Okay, maybe I am doing something wrong. I was able to use your older export script previously, but now I am not even able to export a textured cube. I UV unwrapped the cube, added a second UV channel for the lightmap, made sure the cube was textured and the texture was saved as a TGA, with a single material linked to the texture using the model's UV map. Turn of Live Unwarp in Mesh Options. It is the only option, thats effecting the ASE script. Other then that, everything is fine. I know I have my setup so it automatically unwraps when I add seams, but once I pin the vertices in the UV editor, shouldn't they stay put when a UV unwrap is being performed? I downloaded your file, opened it up and was able to export it with out doing anything to it (with no error messages). I am using Blender 2.57b and 1.1.0 of the exporter script. Are you sure you have the correct version installed (checked your Add-Ons section for the version number). MCampagnini, here is a simple blend mesh that produces an error on export, whether or not I choose the convert to tris option. This is not the same complex mesh that gave me an error earlier, but I can see about possibly uploading that later if you want. This worked as well. I don't think it's an issue of your model or the exporter, but maybe something else. I will try and import the ASE files to see if there is anything wrong with them. EDIT: Both imported fine, look fine, have 1 material, 2 UV channels and no collision. For some reason sometimes when I export my model, some of the normals get flipped around, and it's impossible to fix the model afterwards. The "Assign Selection" function for the Smooth Groups didn't seem to put the faces into a new group either, btw. And the "Clear Existing" checkbox produces an error when you run the automatic selection for the first time and no Smooth Groups were created yet. Until it's solved, what are the best settings for the Blender FBX exporter to get no ugly smoothing? First I'd like to say, great plugin. Thank you for bringing a little Blender support with UDK since there's just no way I can afford the tools it's meant to be used with. But now, I have a bit of an issue with the plugin that I think I saw someone else mention a few pages back here as well. Basically, I export just fine, I import it into UDK just fine. The problem is that sometimes it flips the faces on my models. So I get a gaping hole on one side, and the lovely wall that was supposed to be there is on the other side. I'm using Blender 2.57b. Is there something I'm doing wrong in regards to exporting one sided models? Thanks for any help and thank you for the plugin. Select your mesh in edit mode & recalculate your normals before exporting. Shortcut is "CTRL+N"
Thanks for the quick response, but I tried that and no luck. The old exporter that I'm using doesn't have this issue (using an old old old one for Blender 2.4 series) but as soon as I use the 2.57b one I have flipped faces. Recalculating the normals seems to have no effects what so ever. Upload your mesh, i'll look into it. Sorry, I must've just clicked the flip button a time or two many and caused problems where there were none. It's all working splendid now after a bit of tinkering. So yeah, works now, thanks for the help though - I didn't know about the normal recalculation button untill today. Glad to be of help. invest some time in blender, it works wonders. hey everyone, letting you know i'm still alive; albeit, busy. I'm going to find a new spot to host the script, ill be shutting down the website (wasn't happy with the provider). I still have plans to finish the export script, but after everything settles down. If anything, im sure odedge will be happy keep the latest versions on his site! Ok, Is it just me or the exporter is really messing up the UV's? I think there was some discussion earlier about problems happening if you have UVs pinned in Blender. Are you using that functionality by any chance? nope, I just exported a static mesh, with only 1 uv set, and it just garbled up after export (IN blender, not in UDK). If anything, im sure odedge will be happy keep the latest versions on his site! I uploaded the 1.0.5 version and the latest 1.1.0 version. I presume you will get a site up relatively soon? If not, I can duplicate your existing page on my site (not sure about the video) and keep it until you do. I have had the problem with the UVs getting messed up. 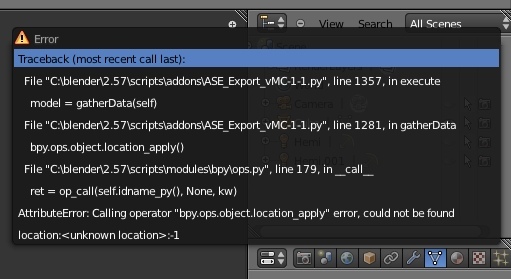 While I noticed it after a export, I have also had the problem before exporting, so I figure it's a Blender problem and not an exporter problem.